Our high quality design splice tray has proven itself in over 20 years of installations in both singlemode and multimode applications. Only the highest quality fiber connectors and adapters will do! We are committed to continually upgrade and expand our product lines to better serve the communication industry. We have built our reputation with distributors and end users by meeting or exceeding the specified requirements. Our record of delivery, service, quality, and customer satisfaction is unsurpassed in the industry. Custom Applications? Yes, we can handle that! 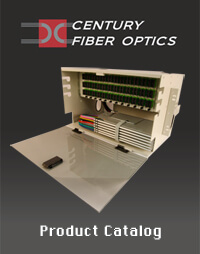 Century Fiber Optics offers extensive design and manufacturing capabilities for custom applications. Our pre-wired “plug and play” cabinet solutions will save the customer or installer considerable labor cost. All components in our pre-wired cabinets are matched to assure that there are no compatibility problems in the field. Our strength is in making sure the end user has the right product for the application, either from our “standard” offerings or by quickly and economically developing just the right configuration of enclosure, module, assembly or combination that will meet the need. Our goal and commitment is total customer satisfaction in quality, pricing, delivery and service. See what some of our customers have to say…Click Here. Let us help you build your infrastructure. Century Fiber Optics manufactures a complete line of fiber optic interconnect products for wall mount, rack mount, and OSP applications. Our strength is in making sure the end user has the right product for the application.